Kristin Roubie, DSCE, is an experienced solutions sales and marketing professional with a history of helping clients use the latest interactive technologies to inspire better brand experiences and productive work environments. 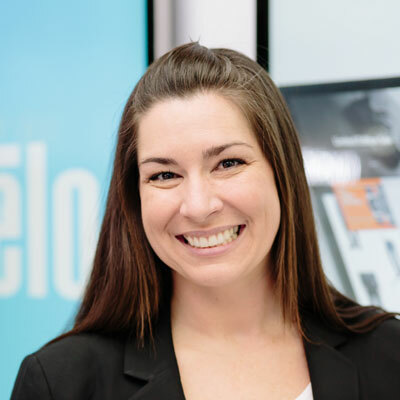 With 14 years' experience in digital signage and the ProAV industry, Kristin is working as Elo's channel sales manager for interactive solutions, growing Elo's presence within the ProAV vertical by connecting with new partners, resellers and industry thought leaders. Spending 11 years on the front lines for a systems integrator has uniquely positioned Kristin to understand the needs, objectives and obstacles of Elo's customers, enabling her to better serve her internal and external clients. I have taken Elo from an unknown name in the ProAV vertical to a legitimate solutions provider. We have gained net-new business and clients from this initiative, which has led to a new revenue stream. With ProAV being a new space for Elo, our product offering is not always an exact fit. I continue to work closely with our product management team to ensure the needed features and strategic partnerships are prioritized to enable Elo to offer complete solutions. My promotion of this important channel has taken me all over North America for industry events and tradeshows to better establish Elo's presence within ProAV and better align Elo with associations and sponsorships well-suited to build our brand with customers and partners. Based on the foundational work I did in 2017, in 2018 Elo will launch several solutions bundles enabling us to market our products to a new client base. With these strategic product launches, I hope to gain Elo recognition as a global solution for the education and enterprise interactive space. Ultimately, my goal is to exponentially grow our large format signage business and market share. The honor that I am most proud of is my stepdaughter naming me "stepmom of the year." As a professional who travels every week, her support means the world. I am also proud that I exceed 100% of my Elo sales quota last year and expect to do so again this year! I respect Sheryl Sandberg and the recognition she has brought to gender differences in the work place with her book Lean In. Working in a predominately male industry, I have used her advice and knowledge to help guide my career decisions. One woman I know and admire personally is a coworker and channel manager at Elo, Nancy Lanese. Her knowledge and dedication to the channel she runs pays in orders and loyalty from her customers. The expertise she brings to our team is invaluable, and she is respected internally and externally. I learn from her daily and greatly respect her. Do what makes you happy. Life does not have a rewind button, so change the things you can, and let go of the things you cannot. If there is something you want, go get it. If you have a dream, follow it. Do not let fear hold you back. Trust your instinct and believe in yourself; you are capable of more than you think. Learn from your mistakes, but do not dwell on them. Be confident in who you are; hold your head high. And surround yourself with people who lift you up and make you better. One skill I would love to learn and master (if this is something one can master) is coding. This is so relevant for all seeking employment in the technology industry and in being able to offer turnkey interactive solutions. Within any interactive signage deployment, content development is the most challenging component. Elo touchscreens are only as good as the content played on them. So being able to offer those skills to my customers would be a significant asset, and my creative side would enjoy the outlet. I tend to read lighthearted novels about love, laughter and friendship - with the occasional drama - as stress relievers and outlets. However, one book that I found interesting was The Atomic Weight of Love. It is about a successful woman who let her dreams go to follow her husband's dreams, which in turn made her unhappy and led her to another man. I realized how thankful I felt for my life, my job, and my husband. Also, I always recommend Lean In to professional women, especially those just beginning their careers, as a valuable resource for career advancement.